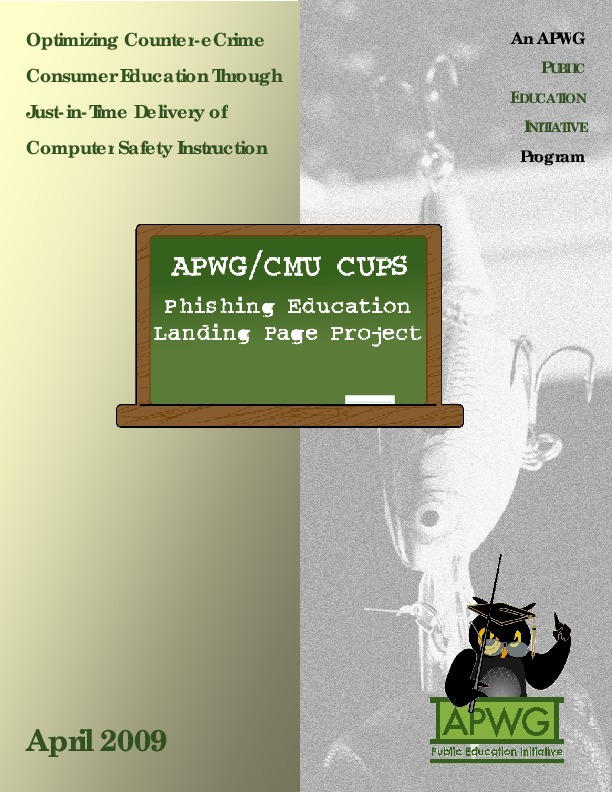 The APWG’s Internet Policy Committee (APWG-IPC) and the Carnegie Mellon Cylab Usable Privacy and Security Laboratory (CUPS) have joined forces to educate consumers about phishing and established the APWG/CMU Phishing Education Landing Page program. The goal of this initiative is to instruct consumers on online safety at the “most teachable moment”: when they have just clicked on a link in a phishing communication. The phishing education landing page answers in 21 languages. Scripts interrogate users' browswer setting and serve up the right version. The APWG-IPC and CMU’s CUPS created a webpage to educate users about phishing. The page (click here) explains that they have just fallen for a phishing communication (email or otherwise) and advises consumers and enterprise users ways they can help themselves to avoid being victimized in the future. The APWG and CMU’s CUPS encourages all brand owners to approve this process, all takedown providers to request the use of this redirect scheme, and all ISPs, registrars, registries, etc. to redirect to this page instead of serving an error page. DOWNLOAD the data sheet describing the APWG/CyLab Phishing Education Landing Page.